The Big Green Gathering is an award winning festival. It features just about all you can image in the areas of sustainability, organic and eco-friendly living. It's THE festival for entertainment and education for sustainability. From music, farming, crafts, ethical campaigns, permaculture, markets, fairground fun, sustainable homes, organic food, a village green kids area, green enterprise and business fields this festival has all the resources to learn and enjoy green living. Solar and wind powered the Big Green Gathering runs for five days from the July 29th - 2nd August 2009 in the Mendip Hills in Somerset. For those greenites who believe in green energy but have yet to see the inner complexities of how it actually makes things do things this festival is an ideal opportunity to see renewable energy in practice. The Big Green Gathering is held on Fernhill Farm. It is a working organic farm and conservation site as well as a registered Area of Outstanding Natural Beauty. 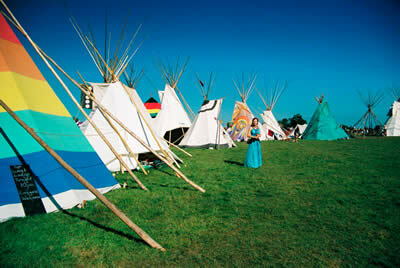 There is onsite camping and facilities including an organic shop, showers, fires and recycling bins. You can order groceries online and pick them up on arrival at Sound Bites, a wholefood shop that specialises in local, organic and fair trade food. For tickets and information about the event and the course run at the farm visit The Big Green Gathering website.